iPhone 5 benchmarked: The fastest smartphone in the land! The iPhone 5 looks to be the fastest smartphone we’ve ever tested With its mysterious, Apple-designed A6 processor, the iPhone 5 is unique in the world of smartphones. Most high-end phones nowadays run on one of two architectures: ARM’s Cortex-A9, which is used by Nvidia, Texas Instruments and others, and Qualcomm’s Krait. But the A6, as AnandTech discovered, is something completely differentâ€”an ARM-compatible system-on-a-chip designed, top to bottom, by Apple. The iPhone 4S running the Safari browser in iOS 6.0 on a dual-core 800MHz A5 processor is about on par with leading Android 4.0 phones like the Samsung Galaxy S III and the Motorola Droid RAZR M, both of which are using 1.5GHz Qualcomm Snapdragon S4 processors, or their equivalent. Obviously, the difference is that Safari is a faster browser than the Android browser. The iPhone 5 takes things to the next level with a processor that can compete with the S4 along with the fast browser. Its Browsermark score is 80 percent higher, and it shows much quicker Sunspider times. GUIMark, like most mobile on-screen graphics tests, maxes out at 60 frames per second because that’s as fast as your screen updates. Geekbench is a processor benchmark, which tests the basic components of a phone’s system. Here you see less of a difference, but it’s still there. Look at the subscores. The A6 and the other processors do math about as fast as each other, but the “memory” and “stream” scores, both of which test loading data in and out of RAM, come out much better on the Apple device. Mix together the two sets and you see how much of a difference the Safari browser makes, but also that the iPhone 5 still wins with the browser taken out of the picture. GLBenchmark 2.5 is a graphics benchmark, creating and walking through simulated game scenes. Performance in the “onscreen” tests is dependent on a phone’s graphics power but also on screen resolution (you can do more frames per second if you’re pushing fewer pixels.) The “offscreen” tests are purely graphics-crunching power. The Galaxy S III has 26 percent more pixels than the iPhone 5 (921,600 to the iPhone’s 727,400) but as you can see, in the “offscreen” measure of raw graphics performance, the iPhone 5 doubles the Galaxy S III’s result. It’s simply a more powerful phone. A phone’s hardware performance can’t be taken in isolation, but it’s definitely a piece of the puzzle. Based on these benchmarks, the iPhone 5 lives up to the promise of being twice as fast as the iPhone 4S. It’s also, for now, the fastest handheld computer sold in the US. Apple iOS 6 update starts rolling out globally!! There is good news for all those who own Apple iOS devices. iOS 6, the highly anticipated update to the mobile and tablet platform has officially started rolling out as of last night. Unfortunately, the release of the new OS didnâ€™t go as smoothly as one would have hoped. Early iOS 6 adopters have been reporting that after updating their devices and connecting to Wi-Fi, Safari would launch on its own to verify whether the user was using a Paywalled Wi-Fi connection or not. What this led to, was Safari not being able to load the verification page at all, leaving hundreds, if not thousands, of users without the ability to connect to their own Wi-Fi networks. However, Apple has issued a fix for this problem on their end and users should be able to go ahead and connect to their Wi-Fi networks without any hiccups. We are still in the process of running our iPhone with iOS 6 through intense use to see if there is any change in battery performance, so we will update on that front at a later point. You can read our hands-on with the new OS here and see which of the features will be supported, given that we are in India. For starters, there is no turn-by-turn voice navigation when using GPS. As a word of caution, we recommend ALWAYS taking a full backup of your device before updating the firmware on your iOS device. Once iOS 6 is installed, you can then proceed to restore from backup, ensuring that all your information is intact. Apple iPhone 5 versus competing flagship smartphones! Last night Apple unveiled to the world their sixth generation smartphone, the iPhone 5. The device was pretty much a culmination of all the rumours that have been doing the rounds since January and the launch felt like a really bad kept secret. Nonetheless, theÂ iPhone 5Â has received some good first impressions from the people who got hands-on time with the device at theÂ launch event. Todayâ€™s flagship smartphones are not only about the looks and style but also about the power under their hood and what new they bring to the table in terms of their features and performance. So here we take a quick look at the specifications and the USPs of the iPhone 5 versus other flagship smartphones â€“ theÂ HTC One X,Â Samsung Galaxy S III,Â LG Optimus 4X HDÂ and theÂ Nokia Lumia 920. From the above chart we can notice a few similarities between all the flagship devices. For starters all of them boast of 1GB of RAM making them quite snappy, with smaller load times. The front-facing camera on all the devices was 1.3MP except the Galaxy S III, which has a 1.9MP camera. All the Android-powered smartphones run on ICS straight out of the box. All the phones feature a 720p HD resolution displays. When the iPhone 4 was launched, it brought with it the revolutionary Retina Display. It took the competitionÂ nearly a yearÂ to catch up and bring about displays that boasted of an HD resolution (most commonly 1280×720). Whatâ€™s disappointing to see in the iPhone 5 is that even though the size of the display has gone up to 4-inches, the resolution of the display has lost its edge when compared to the competition. The iPhone 5 has a pixel density of 326ppi. That brings it close to the Sony Xperia ion, which has 323ppi. 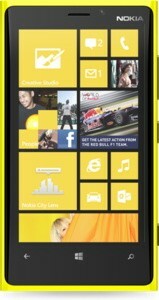 The clear winner from the above table is the Nokia Lumia 920 with 332ppi. This doesn’t mean that the displays on the other smartphones are bad, itâ€™s just a reflection that Apple, the company that once held the benchmark of smartphone displays, has lost the edge it once had in the game. The Xperia Ion has the biggest camera sensor of the bunch, however,Â as we have seenÂ its low-light performance is nothing to write home about – something the PureView camera on the Lumia 920Â apparently excels at. We will have to wait and see what wonders the iPhone 5â€™s camera can perform. It brings with it a bunch of new features such as improved optics, an f/2.4 aperture five-element lens, a BSI sensor, Hybrid IR filter and it is roughly 20 percent smaller than the iSight on the 4S. It also features a new panorama mode that allows users to create images that are 28MP wide when stitched together. We will reserve our opinion for which is the best smartphone camera when we put them through their paces ourselves. In terms of the battery life, we have tested all the devices except the Nokia Lumia 920 and of course, the recently launched iPhone 5. All the tested devices last for nearly a day and a half except the LG Optimus 4X HD, which boasts of 2,150 mAh battery, and lasted us for almost two days with average use. Apple promises the following battery life for the iPhone 5 â€“ 3G talktime/browsing up to 8 hours, Wi-Fi browsing up to 10 hours, video playback up to 10 hours, music playback up to 40 hours, and a standby time of up to 255 hours. If it delivers anything like the promised figures, it should be amongst the less power hungry offerings. The Apple iPhone 5 certainly goes a long way in redefining slimness, with a thickness of just 7.6mm. If the svelte nature of a phone truly matters to you, the iPhone 5 stands out from the rest of the flagship smartphone crowd – the next slimmest device is the Galaxy S III, at 8.6mm. The new iPhone runs on Appleâ€™s latest iteration of its mobile OS â€“ iOS 6. Apple announcedÂ iOS 6 at WWDC 2012. The company has revealed that iOS 6 will be out on September 19 and will be compatible with the following devices â€“ iPhone5, iPhone 4S, iPhone 4, iPhone 3GS, the new iPad, iPad 2 and the iPod Touch 4th gen.
With iCloud and iOS 6, Apple has a new feature called Photo stream. Apple has also brought panorama mode to the iPhoneâ€™s camera in the new OS. 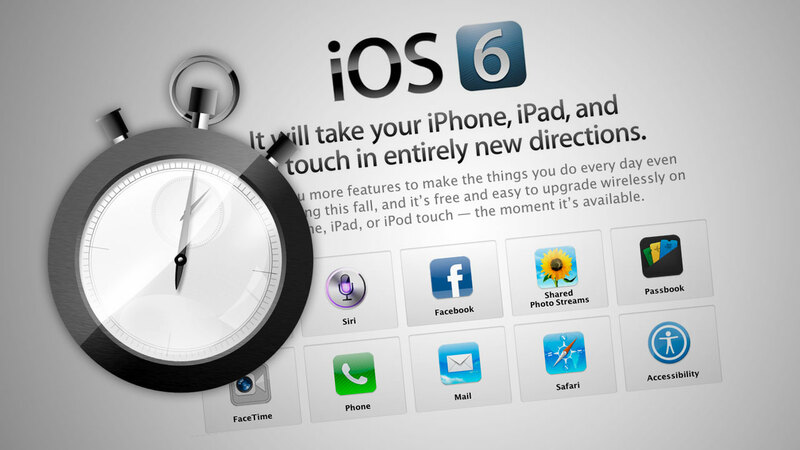 We have seen the capabilities of iOS 6 and Apple showed us another glimpse of the new features of the OS. AsÂ we reported earlier, Apple has ditched Google Maps for aÂ Map app of its own. Maps for iOS 6 has been updated with features such as POIâ€™s (Point of Interests) along with turn-by-turn directions, satellite imagery, and 3D view. Apple has also ditchedÂ YouTube as a native app on iOSÂ and now users will have to download it from the App Store. In iOS 6, apps such as Safari open in full screen mode. Apple showed off this feature on the iPhone 5 and it looked quite good. We really had high expectations for the iPhone 5 and just how Apple would try to outsmart the competition. Frankly however, we were left a tad disappointed. Not because the device wonâ€™t deliver what it promises, but because it is exactly what we have already seen in the leaks that have been making the rounds on the internet since January. iPhone 5 to feature a Nano SIM tray? Apple is expected to launch the next generation iPhone, the iPhone 5 around September 12th and the rumour mills are hard at work, churning out new information about to Appleâ€™s upcoming smartphone. The latest rumour suggests that the device will feature a â€œNano SIMâ€ tray. Images have surfaced on the Internet suggesting what the tray may look like. 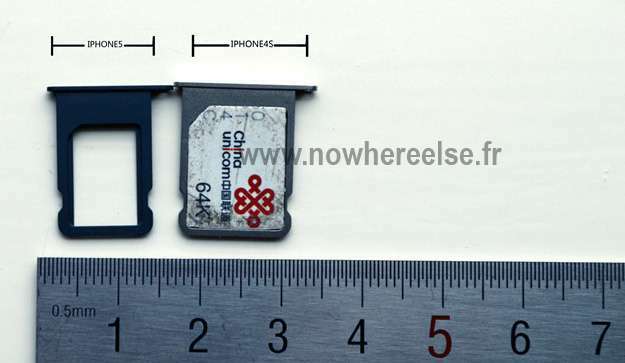 The report comes fromÂ nowhereelse.fr, which shows off the images of the new Nano SIM tray. This isnâ€™t the first time thatÂ AppleÂ will incorporate a new type of SIM card in its smartphones. The iPhone 4 was one of the first devices to incorporate the Micro SIM card and this has been adopted by other smartphone such as theÂ Samsung Galaxy S IIIÂ and more. The Nano SIM will be 40% smaller than its predecessor and this will allow the next iPhone to be very slim, or fit more capabilities into the same space. If the advantage of the Nano SIM is that the next iPhone will be slimmer, the disadvantage is that it will lead to compatibility issues with other devices and in a country like India where users change there smartphones on a regular basis, this may be a bit of a problem. In the recent past we have heard many rumours about Appleâ€™s next flagship device. Some rumours suggest that the device will have a new smaller dock connector. We have even seen an iPhone 5 assembled from leaked parts. Other rumours making their rounds on the Internet suggest that the device will have a larger display than its predecessor and also have a smaller home button. Microsoft has launched Outlook.com, a new, feature-packed web-based email system that will eventually replace Hotmail. As it continues to prepare for theÂ impending release of Windows 8, Microsoft hasÂ launched Outlook.com, a new web-based email service that embraces the name of the companyâ€™s well-known desktop email client, and will eventually replace the aging Hotmail. PreviouslyÂ leaked as Newmail, Outlook.com doesnâ€™t only offer email, as it also incorporates social networking integration, SkyDrive, Office Web Apps and in the future Skype video chat â€” showing Microsoft wants to challenge Gmail and Googleâ€™s suite of online apps. Hotmail, which Microsoft acquired in the late 90s, is still a major player in the market, boasting the most users compared to its rivals; but its share is decreasing and Google is waiting to pounce. Little has changed for Hotmail over the years, and Microsoft says it realizes it must â€œtake a bold step, break from the past and build a brand new service from the ground upâ€ if it wants to compete. The result is Outlook.com. Visually, itâ€™s in keeping with Microsoftâ€™s Metro interface, and anyone familiar with Windows Phone or Windows 8 will feel right at home. Like the recently renovated Gmail, thereâ€™s a lot of white space, but Microsoft is keen to point out some key differences between Outlook.com and Gmail, such as the lack of adverts displayed in the conversation window, and how it wonâ€™t pass information gained from emails along to advertisers. Social interaction is a big part of Outlook.com too, with the ability to connect to Facebook, LinkedIn and if you search for it, Twitter as well. In the near future, Skype will be added and allow for video chats without leaving the site, while Facebook chat is built-in too. Social updates are delivered by mail, and all your contacts are imported, where they can then be grouped together. Other features include Microsoftâ€™s spam filter, a â€œgraymailâ€ filter to keep subscribed email content such as shopping site updates and newsletters separate from junk mail, plus unlimited email storage space. Microsoft also says that the clean design shows 30-percent more messages on a single page than other webmail clients. Finally, Outlook mail can easily be setup on your phone or tablet, and it uses Exchange ActiveSync too. Itâ€™s still early days though, and as Outlook.com is still a â€œpreviewâ€ version, not all the promised features have been added, and even those that are donâ€™t all seem to work yet. Donâ€™t let that put you off though, and if you want to try it, you canÂ sign-up for an Outlook.com email address right now, or if you already have a Hotmail or a Live.com account, it can be upgraded through the settings menu. Internet is abuzz with reports that Apple’s next flagship smartphone, dubbed as the iPhone 5, may not be featuring Samsung’s memory chips, displays and other components. Apple has reportedly shifted some memory-chip orders for its next iPhone from Samsung to other Asian chip makers in an attempt to ‘diversify’ its lines of supply for memory chips and reduce its dependence on Samsung. Samsung, however, hasn’t been completely ousted from theÂ iPhone 5Â supply chain. Reuters quotes a person privy to the development as saying that Samsung is still on the list of initial suppliers for the forthcoming iPhone 5, which is expected to be unveiled onÂ September 12. The source, who declined to reveal his/her identity, rejected the notion that the move was an aftermath of the patent-war between the two companies, which recently got murkier with Samsung being asked by a US court to shell out more than $1 billion in damages to Apple for infringing upon the latter’s patents. According to reports,Â AppleÂ is now going ahead with Japan’s Toshiba Corp, Elpida Memory and Korea’s SK Hynix to supply DRAM and NAND chips. “Samsung is still in the list of initial memory chip suppliers (for new iPhones). But Apple orders have been trending down and Samsung is making up for the reduced order from others, notably Samsung’s handset business,” the Reuters source said. Despite being a major competitor in the smartphone market,Â SamsungÂ is one of Apple’s largest component suppliers. Apart from memory chips and processors, Samsung provides displays for Apple’s iPad. Wall Street Journal in its report citing other people familiar to the situation points out that the new Asian partners use different technology than Samsung. The report further says Apple anticipates huge demand for its product, thus aims to ‘diversify’ its supply chain for chips. Top games to watch out for in September!! September has its own fair share of great games however, which will keep gamers occupied before the likes of Hitman Absolution and Assassinâ€™s Creed III take on the market. It is another month, another list, and more games to give you a kick! A sequel to 2000â€™s Tekken Tag Tournament, Tekken Tag Tournament 2 brings the action of the arcades to the home consoles. The roster of characters is a blend of old and new that will appeal to veteran fans of the franchise as well as intrigue new comers. The game will offer a variety of modes such as 2 vs 2, 1 vs 1 or 2 vs 1 battles and a bunch of online modes. Gamers can get set to pull off some of the craziest combos as Tekken Tag Tournament hits store shelves on September 11 for the PS3 and the Xbox 360 for Rs. 2,999. Borderlands 2 is a sequel to 2009â€™s Borderlands and can be considered as one of the most anticipated games of 2012. The game stays true to its roots and is a first person shooter with RPG elements thrown into the mix. The sequel features all new characters, environments and enemies for you to take down in new and unexplored areas of Pandora. Players can choose from one of the four new characters, Salvado, Maya, Axton and Zer0. Borderlands 2 launches on September 18 at Rs. 2,499 for the PS3 and Xbox 360, and Rs. 999 for the PC. The next iteration of the popular racing franchise, F1 2012 has new modes for players to play such as the Young Driver Test mode in addition to the regular modes such as challenges and career. Gamers can get into racing mode when F1 2012 launches on September 18 for the PS3 and the Xbox 360 for Rs. 2,799 and Rs. 899 for the PC. Sackboy is making his PS Vita debut with Little Big Planet Vita. The unique controls of the Vita can be used to navigate Sackboy through the environment. You also have the ability to create levels on Sonyâ€™s hand held device and share your creations with the world. Gamers can get creative with Little Big Planet Vita on Sonyâ€™s handheld on September 25, for Rs. 2,299. The fourth expansion pack to the famous MMO World of Warcraft. Mists of Pandaria will raise the existing level cap from level 85 to 90. It will introduce a new character class, the Monk, along with a new playable race, the Pandaren. The vanity pet system will be overhauled and will include a pet battle system. The expansion will also bring nine new dungeons, three new raids, and four new battlegrounds. You can pick up the expansion on September 25, in two editions – Standard Edition for $39.99 USD, Digital Deluxe edition for $59.99 USD – only for the PC. Jet Set Radio brings the classic Dreamcast game to the PC, PlayStation 3 and the Xbox 360. The government is attempting to silence the kids of Tokyo, but with their Overdrive Magnetic-Motor Skating Shoes, the cops will have to catch ’em first. The Jet Set Radio program keeps the kids unified and inspired to fight for their rights of expression, which include graffiti art. Gamers can check out this classic on the PC, PSN and Xbox Live, on September 18. DOA 5 brings to the table the classic fighting action that we have come to love from the franchise mixed with MMA to add variety to the fighting techniques in the game. A nice addition to the game is that as a fight progresses, the backdrop will change and interact with players. Gamers can use the dynamic environment to deliver a lethal blow to their opponents. Gamers can check out Dead or Alive 5 for the PS3 and the Xbox 360 on September 25. 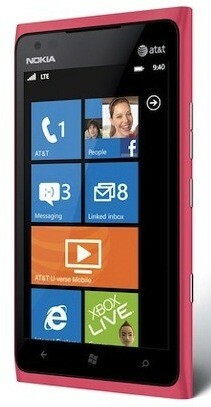 Just five months after grandly returning to the United States with theÂ Lumia 900, Nokia’s switching it out for an even better Windows Phone 8 offering. The 920’s coming with a beefier display, better internals and has wholly embraced wireless charging — but that’s not the feature everyone’s gonna be talking about. No, that’s reserved for theÂ 8-megapixel PureViewÂ hardware and the new imaging tech behind it. Still, that shouldn’t distract from the real business at hand: identifying the tiny hardware differences that separate the current and future iterations of the flagship, which we’ve broken down for you after the break. The GenieAlert provides the features to add custom buttons and functions to be called upon click of each buttons. The Title and the alert icon to be disaplyed can also be configured as per the user need. 1. Click Here to download the GenieAlert. You can download the source from the following repositories. 1. Include the geniealert.js and style.css in the header. 2. Place all the images in the â€œimagesâ€ folder. 3. Arguments for the customized alert, Alert Message, Array of Button names, Array of function names (with the arguments if necessary), Title for the alert window, URL for the image to be show in the alert window. 4. On Calling the default alert(â€œsome textâ€) the customized alert windos with default title as â€œAlert!â€ and an â€œinformationâ€ icon will be shown. 5. Create a Array of Text to be shown in the Alert Box, Create Array of function names to be called when the corresponding buttons are clciked, a Title for the Alert and the URl of the image to be shown inside the alertbox. (Make sure the image is 32px X 32px). 6. Call the function as follows whereever ncessary. A NEW LOW COST SMARTPHONE ANNOUNCED – SONY XPERIA J !!! Sony is arrived with the new smartphone without green logo. Sony Xperia series has added a new member, as the Sony Xperia J. Sony Xperia J is code named ST26, and the phone has been dropped on the web recently. On that occasion I learned that the new smartphone running on Android 4.0.4 and support a resolution of 854 x 480 pixels. The image right side would be new phone, according to Asian website IT168. Interestingly, I see no trace of specific green logo Sony / Sony Ericsson, who was present on all models so far. Rounding up the lower end of the segment is the newly launched Sony Xperia J. The 9.2mm thick phone has a FWGA display. A 5MP camera unit can be found around the back of the phone. The Xperia J comes with a front facing camera to allow video calls. Details are still coming in but the phone will be available in black, gold , white and pink when it is available towards the end of the year. Price for this phone is not yet confirmed. The Sony Xperia J offers a great screen for its price range – a 4 Inches screen of FWVGA resolution and Gorilla glass. The phone itself is powered by a single-core 1GHz Scorpion processor with 512MB RAM and will launch with Android ICS, just like its more expensive siblings. It has 4GB of built-in storage plus what you put in the microSD card slot.